If you have not noticed the very cool footer at the bottom of Desserts Required, please take a second to check it out. I was asked to be a member of The Daily MeaI’s new Culinary Content Network, which I very quickly accepted with pleasure. I am thrilled to be a part of one of the Top 10 websites in the food category and one of the fastest-growing websites of all time, already bigger than foodandwine.com, bonappetite.com and saveur.com. I made all of the recipes, because I was not going to be defeated by a fish or homemade ricotta. What I discovered was that of the two recipes I did not know how to make, I LOVED making ricotta from scratch. I was calling my kids in to see how cool the process was of cooking the milk and buttermilk until the curds separated from the whey. Shoshana walked into the kitchen, peeked over my shoulder and said, “You are cooking milk, no big deal!” Kids today! I realized, when I started gathering the ingredients together for the pots de crème, that I have never made anything that is truly butterscotch. Chalk it up to my first drinking experience, or shall we say, “overdrinking experience,” but I have not liked the taste or smell of scotch whiskey ever since; that is until now. Samuel, my 6 year old, came in to help me. He had fun seeing how a vanilla bean gets split and scraped, thought the cardamom smell was, “Not bad” and enjoyed seeing what strips of the lemon zest look like. I was more interested in finding out what the dreaded scotch whiskey did to the pots de crème and pecans. I was delighted when I saw the creaminess of the pots de crème and was mesmerized by the pecans. I have been caramelizing and baking pecans for longer than I can remember. Yet, I never tried cooking them on the stove for a bit and then finishing them off in the oven. Once again, the scotch whiskey surprised me when it cooked off, leaving a very pleasant aroma and taste. 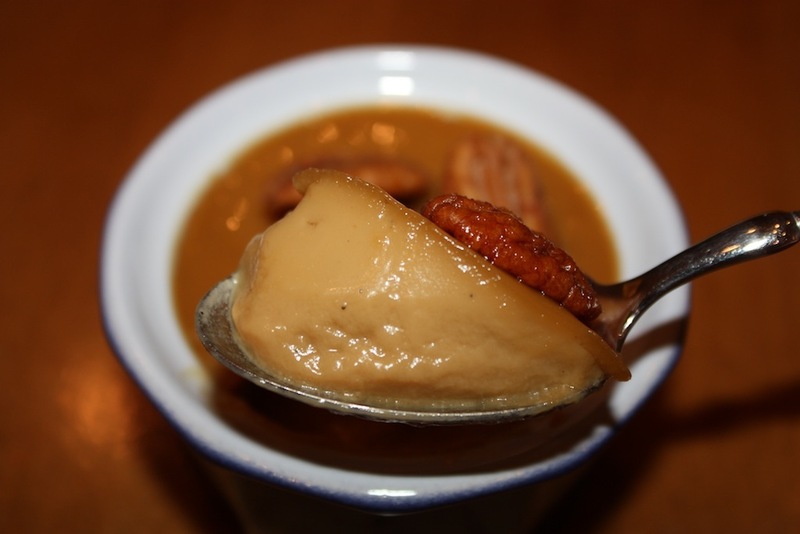 Don’t get me wrong, I will not be sitting down with a scotch on the rocks, ever, but I will most definitely be making this incredibly smooth, deliciously decadent Butterscotch Pots de Crème with Scotched Pecans. With recipes as tempting as two out of the three turned out to be for this round of the Cookbook Club, I can’t wait to see what the next batch of recipes brings! Preheat the oven to 300°. Place 8 – 4 ounce ramekins into a large roasting pan and set aside. Bring cream, lemon zest, vanilla bean and seeds, salt and cardamom to a boil in a saucepan over medium heat. Remove from heat and set aside to steep. Place butter and brown sugar in a small saucepan. Once mixture bubbles, add whiskey and stir until whiskey evaporates, about 1 minute. Whisk egg yolks in a large mixing bowl. Gradually add butter/brown sugar mixture, whisking constantly to avoid curdling eggs. Strain cream mixture directly into egg bowl and whisk to combine. Transfer mixture to a liquid measuring cup that will pour easily. Evenly distribute cream mixture into 8 ramekins. Pour hot water into roasting pan so it goes halfway up ramekins. Cover with foil and bake 20 minutes at 300°. Carefully remove foil and bake an additional 35 minutes, until pots de crème are set. Carefully remove from oven and cool in pan of water. Once cool, cover with plastic wrap and refrigerate until cold. Place pecans, whiskey, butter, sugar and salt into an ovenproof skillet. Cook over medium high heat until whiskey evaporates. Transfer pan to 300° oven and roast until nuts are golden brown, about 15 minutes. Remove from oven and cool. Place a few nuts on each Butterscotch Pots de Crème and serve. Ted Allen serves his Butterscotch Pots de Crème with lightly sweetened whipped cream. Scotched Pecans are delicious to serve on their own. Additional time is needed to refrigerate Butterscotch Pots de Crème. Hey, Betsy — congrats on growing your audience! Everyone should share in the deliciousness of your desserts. Really, really good! Thank you. I am so glad you enjoyed this recipe! Thank you for letting me know.